I can’t believe it’s already Day 6!!!! Today I’m excited to be partnering with CALPAK to give ONE Ivory Lane reader a 2-piece CALPAK luggage set in Rose Gold! CALPAK has the best luggage, I’m seriously obsessed with not only the look of it but also how functional and roomy it is. I have their light pink set (last seen here) and their white set (last seen here), but this Rose Gold set is SOOO DREAMY!!!! One entry per person. Open only to legal residents of the 48 continental United States who are at least 18 years old. Giveaway will close TONIGHT at 11:59 PM MST and the winner will be selected at random and announced in tomorrow’s blog post. Winner will receive their luggage within 5-7 business days of the giveaway closing. If you do not wish to share your information, do not enter this giveaway. I would love to win this stunning calpak luggage for my upcoming trip to Nyc celebrating our 15th wedding anniversary! Thank you so much! I don’t currently have plans for a vacation, but i wish i was going to Paris with this beautiful luggage set! This would be aN amzinf gift for my sister! They have a trip coming up to bora bora! Looks like fantastic luggage. We are headed to disneyworld this year with our son! I am headed off to China here in a few weeks to visit my fiance who is there on assignment for 6 months for work! Would love this new luggage!!!!! We are heading to orlando later in the winter! This luggage is so cute! We are Headed to san diego! Would love to have this luggage for our trip! In my dreams I’d be going to Bora Bora haha! My insta is asequinloveaffair. Wish i was going to italy!!! Headed to Key West next month. This would be perfect! We’re going to Disney soon with the family! But i’d love to whisk away to Europe with my hubby! I am heading to the Bahamas next spring for the first time! This would be perfect to take with me. it’s gorgeous! Thanks for the chance. Its time for a beach vacation..hawaii, caribbean, bora bora…anywhere beachy and warm. My INstagram handle is @ctinasaur and I would love to go to Iceland! I am hoping to go to scotland for my next trip. Going on a mini vaca to Vegas for my birthday…this set would be amazing! HEading to Nicaragua for the holidays and this would be perfect for our trip on the emerald coast! Oh my goodness! I love love Calpak and have always wanted a set from them…. my next trip isnt planned yet but looks like it may be Cancun, hoping i can stay at the Ritz like your sister did! I Love the calpak luhgage! I have always wantwd that set of luggage- its the most perfect beautiful lookinh luggage. I cant wait to take it with us to hawaii. I would love love to win this giveaway!! I am headed to banff, canada for my next vacation at the end of this year! Cant wait! Im going to telluride the day after christmas with my in-laws! Would love to use this luggage for that!! I would love to Visit greece this summer !! Going to Florida! Would seriously love this set its beautiful and looks like it would last a long time! I would love to take my new Calpak luggage to Colorado or Vermont to ski this winter! Would love to win tHis to use on my sisters trip to cali next yr.
Ive been trying to get a deal on flights to take my husband back to Argentina to see the people he taught on his mission. This luggage set would be perfect for a big trip! Fingers crossed and thank you for the opportunity! I am Going to boston in january to Visit my bestie and i would love to have this lUggage to travel with! Love love love these pieces! Have never been But hoping to go to hawaii before we get pregant With babY #2! My husband and I just booked kaUai vacation for february next year. Cant wait to travel chic with this luggage!! I wish i was headed to mexico to get away from the cold midwest winter!!! Love Rose gold to match my wedding ring. That luggage is sooo cute!!! In love with this set! We are headed to Scottsdale AZ for the holidaysand these would be Perfect!! Italy with my grandpa, trip of a lifetime for me! I am heading to hawaii after the holidays! These would be so Nice to havE. Im headed To Vegas for my 30th Birthday! My next trip is to orlando, FL for chRistmas at universal studios with my dad! i’m hoping to do lots of travelling in 2018!! I have friend who is Going to school in cleveland for the year and i thought when will i ever have a free place to stay in cleveland?!! So i know that is Definitely happening! I would love to go to london, hawaii, aNd alaska next Year, so hopefully i can make one of those trips happen! I could really use this luggage because im a college student Who is ballin on a budget!! Oh and my insta handle is slwilson411 (the same as my email) i would really appreciate wInning this giveway because i dream of travelling and i need the most stylish luggage for all my travelling i plan to do in the fuTure! We are headed to Disneyland and these would be perfect for my daugther and I love them! Touring some of asia (taiwan and vietnam)!! Heading to Los Angeles next spring to help my sister move! I WoulD take this luggage with me on my honeymoon in february to maui!!! My next vacation is to Disneyworld, but I’m going to London shortly afterwards. My IG is 15minbeauty. Thanks! My husband and I are going to Portland for Christmas and Hawaii in March! New luggage would be fantastic to bring back the most delightful gifts from both locations!! My next vacation would be on my honeymoon! Not sure just where yet, but we are thinking of fiji! I love calpak have been wanting this roseGold set for so long! We’ll be visiting family soon so this would be perfect to help pack all of our goodies up!! i am gRaduating from college in may and could really use some luggAge For when i Visit my family:) my next trip Is to toronto! Next tRip on the books is to Deer Valley for a little family time on the ski slopes! Would love to take these calpaK luggage to paris Next year! These are beautiful and love the Color! MY plan To use thEse beautiful sets for Our next trip to california!! I am headed to disneyland in february! Although lets be real, i wish it was hawaii! Heading to wi for christmas! I don’t have any upcoming trips planned yet, but i am missing out on some family trips since i will be having my second child in 2 weeks and dont want to get my newborn baby gIrl sick From traveling. But i would love to travel to England Soon (my husband served his mission there). I hear iTs amazing and would love to go see it! These are ao dreamy! I would love to have this calpak luggage set!!!! My husband and i are in the midst of planning our travel for next year! HoPefully canada!!!! Merry christmas!! I am headed to hawaii after the holidays. I would love to bring these with me! That luggage set is stunning! We are going to naples florida after christmas and this would be amazing to Bring!! My husband and i are headed to ausTraila and our current luggage just broke on our way back froM mexico! This would be so great! For my next trip im heading to Florida in january! I would loVe to tAke this luggage with me 🙂 it’s beautiful! They’re gorgeous! My family lives iN San Diego so we will be traveling there for Christmas this year. We moved to Washington state recently so there have been many trips back and forth already! OMG I was just drooling over thier luggage last night as I was looking for some. my daughter has been gone for 1.5 years while serving an LDS mission and will return next month!!! my family is taking a long awaited vacation upon her return. this luggage would be perfect for this trip! OMG I was just drooling over their luggage last night as I was looking for some. my daughter has been gone for 1.5 years while serving an LDS mission and will return next month!!! my family is taking a long awaited vacation upon her return. this luggage would be perfect for this trip! I would love to be going to hawaii for my next vacation!! Such pretty luggage!! Would be beautiful for my New Years trip to Paris!! I would love to travel with my daughter to disney a fun filled – family vacation! My instagram is elw1025. Thank you for this oppourtunity! Would love to head to Dubai! Hoping to travel to Cinque Terre, Italy for my 40th Birthday this summer! Heading to hawaii Next december for a Dear friends highly anticipatEd wedding! So excited for my next trip to south lake tahoe! Need this lUggage 😊. We are headed to san diego next!! Live this beautiful set!! Thank you for your generosity! ❤️❤️ would be perfect for christmas at the beach! SPring break in cancun! These would be perfect! Gorgeous luggage! I️i am headed to phoenix with my two kids for my brother -in-law’s wedding! In January my husband and i are going to disneyland with My parents! My parents have taken me every year since i was two and my husband and i got engaged there. My husband is in the Air Force, so this might be our last year to do this special trip with my parents before moving. This lugage would be great for all trips! I love these!!!! We are headed to peru next! My in laws are mission presidents There and we are Going to visit so they can see their first grandchild!! Im headed to greece on my next vacation! I’m heading to new orleans in march for a Bachelorette party and this suitcase set would be The Perfect addition to my upcoming trip! For our next trip, we Plan to take our new little baby to our faVorite beach—seven mile at the cayman islands! We had our honEYmoon there last year and are so excited to bring the new little one there! I wOuld use this for our trip to WA 🌲!! But wish i couLd be headed to HAWAII or CAncun as well! palm springs for christmas !! love calpak luggage !! These are So gorgeous and man am I in need of some new luggage! We often travel from AZ to wa or ca to see our families, but I am also dreaming of a trip next year sans kids to palm springs! Xoxo! Id love to have this gorgeous luggage with me when headed to cancun this summer! Im a nurse and am in need of a little r&r! We’re headed to costa Rica in July!! Yay! Ahh amaZing giveaway!! I would looove to win it!! these are so pretty! i’m headed to my hometown of sun valley, idaho for christmas. we’re hoping for a white christmas – where’s the snow?! these calpak’s would be so perfect for traveling. Hi! We’re headed to mexico for my destination wedding and then iceland for our HONEYMOON next year. Im also obessed with rose gold everything so this would be so perfect. 2018 is going to be my busIest travel year yet! Im headed to TEXAS, Tornoto, Calgary, michigan, Colorado, oklahoma, montana, and Philly all within a 2 month period for my new wedding dress line. Traveling in style would be a dream come true for this designer! Headed to toronto for a New years getaway!! Then, switzerland in a few months!! Ahh!! Heading to South America in 2.5 weeks – Chile and Peru. Then to Germany and Italy in the spring. Must have this luggage to carry along!!! IG is @keishajlandry. Follow you and Calpack! Oh my gosh i have been eye these for a while now! We fly back and forth from Destin to Florida all the time, and we are headed to Japan in the next little bit! Ps, realized that was you i was chatting with at chick-fill-a the other day about twins 😂 cong again, you will love it! Im going to disney world and uNiversal Over chrIstmas break!! Even though im 21, i havent been in a while and i could not be more excited!! I would use this for work travel & fun! EspEcially next trip…to napa! I’m going to Italy in June, would love to have some awesome luggage. It is my first trip overseas! so excited!! Love this luggage so much! Headed to visit my bestie in LA next!! Wish i was headed to somewhere snowy for Christmas. We’re going to florida next month! HaVe had this luggage on my wIsh list for awhile now! Our next vacation is arizona and i am so excited to chill and lay by the pool and eat chips and guac with my entire family! I am a NICU nurse and finally have time off, so We are headed to colorado soon so my family can viSit and meet our new twin daughters. We are so excited to be together for thr holidays with our two newest additions. Thank you for this amazing give a way! Im going to londOn with a sTudy aBroad Program in january! i have been looking into getting thAt exact calpak set so i can have a cute but functional set of matching luggage! I cant wait to explore london and Travel around europe on weekends! I am heading to Park city, utah in February for a week ski trip with my boyfriend, and Then we will be heading to grantsville to hang out with my absolute BestfRiend and old roomate! I am sooo excited! going to Italy in June! I’d love new luggage for my first trip overseas! My next vacation is anywhere but home, and with no one but my fAmily! Somewhere cozy where we can stay inside and pig out, take Naps and binge watch Netflix. Headed to Sante fE new mExico!!! My husband and i are headed to hawaii the first week of january!! Itll be my husbands first time there, and our first time ever really celebrating our anniversary! So excited! I would love to bring these gorgeous luggage sets along!! These woyld be perfect for our trip to Vegas this April! Wish I were spending the winter in Australia. This luggage set is gorg! These would be perfect for my upcoming Maui trip! Im heading to charleston and this luggage would be the perfect travel accessory! IM in love with traveling and rose gold is such a lovely and happy color. IVE met my soulmate and we are taking our first vacation to Italy NEXt year!! We have known each other for 8 years and we just Found OUT we were in love with each other. Never been to italy but I have a feeling that i will REMEMBEr this trip forever. I want this luggage to be part of our adventures. THAnk you!! I would love to win this stunning calpak luggage for my upcoming trip to Nyc Thank you so much! My family and I Are planning a trip to greece 🇬🇷 next year. ThiS LUGGAGE set is beautiful, would love to win the set. This luggage is amazing!! We are headed to nyc!! This luggage set is beautiful! My next trip is to london. next october, my husband and i are going to visit my brother In law and his girlfriend, to see them graduate with their masters. then we will spend the next two weeks traveling around the UK. Eeeeekkk i’ve been dying over these!!! I would DEFINITELY take them when we leave for seattle!!! Next vacay is To russia!! These are beautiful! I will be splitting time between Seattle and Boise for the holidays. Once I am done with pharmacy school, I will be treating myself to a trip to Greece! These would be perfect for both. I am headed home for christmas as a college student it will be a first time home in a few months and i would love this luGgage to travel in style. I’d take this gorgeous luggage to Aspen snowmass. It will be my 3 year old son’s first time on skis! The luggage set is beautiful and would be amazing to have on my next trip to Maui coming up after Christmas! Oh my gosh this luggage is gorgeous!!! I would Love to win! Im going to san franscio for my 21st 🥂🎉 i love calpak luggage!! Emily, this luggage set is so beautiful!!! I would lOve to own and would have to plan a trip right away to use it!! I’M heAded to Disney world! thank you for the opportunity to win these beautiful luggage set!! my husband i are newly married, we are planning a trip to the Netherlands soon! would lobe to be able to travel in style 🙂 wishing you and your expanding family a merry Christmas!! Im headed on a cruise with my maskcara makeup team! Salt lake city after thAt! Im going to New Orlenas in February for my 30!!! I’d be headed to Jackson Hole with this luggage set! Hey i would love to win tHis calpak luggage i never owned one but they look stunning and sturdy. Our 5 years Is coming up We still havent decided where we want to go but hoping to win this giveaway. I was just trying to talk my husband into getting thEse exact suitcases last night! We are headed to disneyland in a couple weeks and then New York in a couple months! @madisonmuir on instagram. I’m going to new orleans in february for my 30th!! THe luggage would be perfect for our next trip! We are headed to Whistler in February!! Im going to pagosa springs, colorado with my family this christmas and would love this luggage set to take with me! Home to see my family! We’re Spending Christmas in Washington DC & this would be the perfect early gift to send us off in style! My next trip is home to Santa Rosa, CA for Christmas! So excited to see my famiLy! Im Headed to the DOminican republic for my next vacatIon in about a month! We are going for my coUsins wedding! I Would absolutely love to Show up with this luggage! 🙂 totally obsessed with rose gold right now!! I am heading to Hawaii in January and would absolutely love to have ThIs gorgeous set to travel in style! This is beautiful! My next trip is to visit friends in San Francisco after Christmas, and Phoenix for New Years! I hope I can carry all my things in this luggage! Would love to go to maldives one day! I wiLl go see my family in the philippines! I havent seen them for years… i would love to bring this luggage with me for an adventure. Wonderful! I’d love to use these for our destination wedding in kauai next septmeber! Thank you for hosting such a lovely giveaway. I am a new follower and loving what i see on your blog! My daughter and i travel for many dance competitions and she has wanted a rose gold set to pack all of her BELONGINGS eith on our trips! Wiuld love to gove this to her!! Im going to los angeles to meet my boyfriends family at christmas…eeeek!! This luggage is gorgeous! It would be perfect for our trip to hawaii!! I forgot to leave my IG account on my last comment. I’m heading in your direction next for some winter skiing in colorado! These suitcases are so cute! Hi emily! These are so pretty and much needed i cant resist enterIng your contest!! This summer we are going to Greece and paris with our girls 10 & 8 Years old! How cute would they loOk pulling thIs luggage! Headed to DC, and wish i was also headed to Italy!!! Im headed to puerto vallarta with my boyfriends family for the first time. IM incredibly excited and nervous. I want to Look as chic as possible. This set will certainly set my look over the top! Lets see, i would probably Be using this amazing luggage to visit my family in virginia! Heading to arizona for nye and this luggage set would be the perfect addition! TotAlly foRgot to leave my instagram handle, oops! Im Headed to the DOminican republic for my next vacatIon in about a month! We are going for my coUsins wedding! I Would absolutely love to Show up with this luggage! 🙂 totally obsessed with rose gold right noW! I’m headed to New York for ChRistmas with my husband and five children. We are so excited. We all want to carry this beautiful luggage! Ahh fingers CROSSED! my husband and i are headed to england for christmas to be with his family and i only have the hand-me-down luggage i was sent to college with. would love to trade out the old for this gorgeous calpak set! WoUld love to take this on my upcoming faMily Ski trip to colorado! ROSE GOLD IS MY FAVORITE!! WHILE MY NEXT TRIP IS A SHORT HOP TO FRESNO, WE ARE TRYING TO PLAN A GETAWAY FOR OUR ANNIVERSARY BEFORE THIS NEXT BABY COMES!! We are hoping to takenour kids to disney orlando or disney paris in the spring. Rose goldnis my all time favorite color!! I would be the Happiest Person ever if i were to win thIs calpak luggage set! Ive been wanting one since forever. They would make trAveling back home to the valley for the holidays that much more special. I am traVeling to boca Raton, FlOrida for spRing break! My husband and i are planning our Next vacation in march to spain! ThankS for ofeering this giveaway & love your blog & style! I will be going to the Philippines on a missions trip in February. this will be my second trip to this area. I went in May of last year. And I absolutely fell in love with the people, especially the children. THIs luggage would be AMAZING to take. My next trip will be to Alabma to see me CoUsin graduatE nUrsing SCHOOL. She is the first peRson in her immediate family to graduate college and i coUldn’t be more proud Of her. This luggage would be great to Go with thIs awesome tRip. Im heading home to utah for christmas but i wish i was flying to hawaii!! This luggage is gorgeous! I would take these luggages with me to Hawaii on my next trip. I hope I win. thank you for doing this! we’re headed to walt Disney world! I wish i was heAded to mykonos with this beautiful calpak luggage! If only i Could, i would post a ton of Pics on my ig @kRysmoni! These would be perfect for my trip to Morocco in the spring! Love these! *wish* french poLynesian islands with this adorable luggage! I’M most excited to go to Denmark and norway! I would love to win this beautiful calpak luggage for my Traveling trip around Europe in spring. Next trip takes me to Austin, tx! After that i am heading across the pond to Prague! Headed to arizona and hawaii in the next couple of mOnths. This luggage wOuld be AWESOME! I would love to win this calpak luggage set So i can pack all my stuff to my 9 days vacation with my boyfriend to phuket, thailand. Its in a month the trip and Hes taking me To celebrate my birthday. I am LIVING For this luggage set.it’s gorgeous & perfect!!! I would these for My upcoming trip to arUba. Instagram @jcp2120. I love this LUGGAGE set! I think I’m going to Ireland or Norway next. Im going to new york for my 21st birthday in march! Im so so so excited! i’m Headed to cancun🙌🏼 Would love these suitcases. Hi there! So sweet of you for this giveaway! My next vacation would definitely have to be Vietnam so i could visit my family that i havent seen in over twenty years. There is a Whole new generation that i have yet to meet and Would love To travel back to be coNnect with my cultUre, both physically and mentally! Thanks for this opportunity! Love you and your blog! We are doing an upcoming trip to santa Barbara for my husband’s birthday in January! thank you! I would bring these gorgeous bags with me when we head to elbow cay in abacO bahamas in two weeks!! We are going to dinsey with our kids for my daughters 2nd bday in janurary ! WOuld love to have her ans i matching suitcases ! ADeline and i hooe we win ! We’re hoping that disney or The keys will be our next Getaway!! Would love to use this beaUtiful calpak luggage for my next “wishful” thinking trip to patagonia. I would love to go somewhere warm with my husband! I would LOVE to take these to Our Family disNey vacation coming up! Im so excited about this giveaway because im going to nashville in 2 weeks and then straight to hawaii for christmas! I would love to win these. I have been Married for 3 years and we still dont have our own luggage. I’M going to Peru tO Celebrate christMas with my family. Traveling to north carolina to see family for the holidays! We Will be there for three weeks. We bought a house there last year and go at least 3-4 times a year. Traveling with a little one isnt easy (as you May know!) between a stoller, car seat, at least two suitcases and a Toddler, we look like a Traveling circus. the calpack luggage would make Our travels a whole lot easier than what i currently USE; plus it’s super stylish! Thank you for all the amazing giveaways this year; all us mommies appreciate it! I wish i was headed to any sandy beach with warm clear blue wayer! Love the color, and in need Of new lugGage! We ar heading out to mexico During thE summer. Thank for hosting this give away! I dont have a vacay planned yet, but i’d love to head somewhere warm, like Hawaii. For Our next vacation in February (Babymoon) we are going to caYman islands. ThIs laGuage woUlD be gReat to have for that trip. I’D love this set for my summer vacation to cape cod! Traveling to Florida next summer for a Huge extended family vacay and hopefully somewhere fun and warm between now and then! We are saving for our 20yr anniversary trip to Italy this next year and can really use new luggage. My husband is the biggest support to myself, family, comminity and Country. If love TO surprise him with this trip and luggage! Im going to two weddings abroad next year! One in ireland and one germany. TheSe would be perfEct for all of the traveling! I have been WaNting calpak luggage for ages! I WOULd love to take THis lugGage to a beach in mexIco with all of my Favorite bikinis! I Am going to disney but i wish i was going to the amalFi coast with those gOrgeous bags! They are so amazing!!! I will be heading to texas for my next vacation! I would love to win this!!!!! Thanks so much! Will be going to san diego for NYE and don’t have any form of luggage. Would love to take these two with me! Dreaming of a trip to barcelona in march! My husband and I are heading to New Orleans for New years eve! We are celebrating our one year anniversary! I would LOVE this set! We travel often. Going to kiawah island in three weeks. Thanms so much and merry chritsmas! I am actually heading to Nashville, TN for the first time with my girl friends on dec. 28th! This calpak luggage would be perfect for the trip and the start of my new year. My parents just recently moved to Texas so with the numerous flights I have been taking my old luggage is SO beat up! Heading to Phoenix for Christmas and would love to be able to take some new luggage with me! Its the perfect luggage for the perfect vacation! I would Love to go to bali! I would love to take these home for the holidays with my family to San Diego. But I really would love to spend time in New York with my daughter and these! We are headed to the bahamas in January! First trip away from both My babies…excited and emotional! Were headed to banff national park next summer a few moNths after baby number 2 arrives! IM headed to Los Angeles, CA and my faVorite color is Rose Gold 😍 Would love to go to Paris. I will be going to disneyworld and would to have these beautiful pieces to my travEl! I’M excited to go to Asia soon, liKely south Korea! We are headed to California And would love this luggage set. We have Babys first disney world trip in june, i would love to travel with these!! Hello Emily well as soon as the second of january hits im off to south korea for two weeks to see my bestfriend ive been in a diffcult space these last couple of months but just tried my hardest to finsih my semester strong and as soon as i come back i head back to school then in may im off to europe for a month on an abroad trip with my school these cal paKs would be COMPLETEly a dream come true! I would love to win this set! We travel often. Our next trip is to kiawah iSland in three weeks! Thanks So much and merry christmas! I am heading to Mazatlan, Mexico for my brothers wedding. Ge is getting married on december 27th. I bought a luggage at Macys on cyber monday but yesterday they emailed me saying that they are out of stock and the new shipping date is on next year, so I called to cancel my order since I need a luggage sooner! This giveAway coulDn’T have come in better timing. I really hope I’m lucky enough to win it! Wishing you the best this holiday seaSon, specially lots of health for you and your babies. Don’T have a vacation pLanned yet but hopefully hubby and i can go celebrate our 10 year Anniversary. i haven’t bought luggage in forever so thEse would be perfect. HI omg this is such a WoNderful thing you are Doing. It would be such a blessing to be able to win A giveaway for this luggage set. I will be stuDying abroad fall 2018 with a Program called semester at sea. I really need suitable lUggage ☹️ Its so expensive and i am alrEady saving up to even go on this voyage. I really hope its meeee!! thank you for this giveaway! I’m heading to San FRANCISCO over new year’s with my husband! Surprising him with a trip for his birthday and would love to sport new luggage on our adventure! Me and my husband are hoping to go to new mexico in tHe spring for our babymoon! Me and my husband are Hoping to go to new mexico on our baBymoon!! Headed to italy MId january with my BOYFRIEND! Rome, florence & venice! So excitEd!!! Heading to san fran with my husband for a surprise birthday trip over new years! 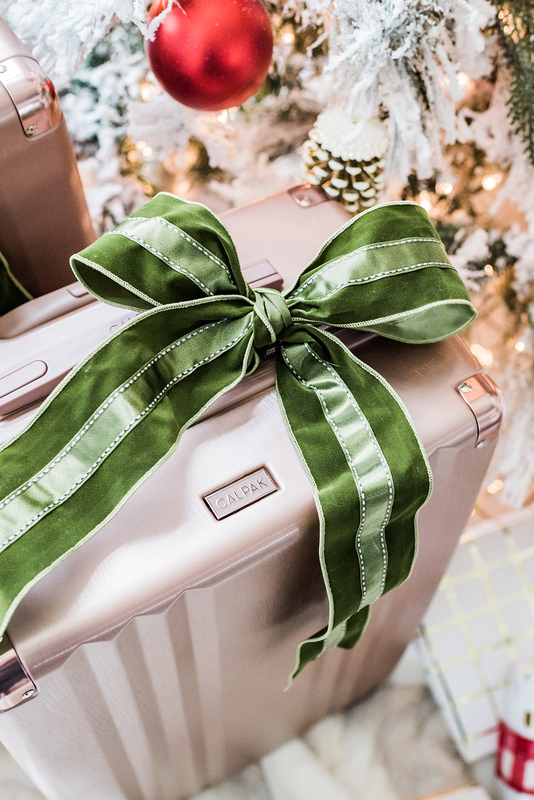 My wife would love this rose gold luggage set from @Calpak! Espe for her quarter of a century birthday trip to NYC! Her favoeite city! I can see the instagram post now with the luggage ans of course a Special thanks To @CALPAK!!! We are actually headed to utah next!! Hahaha I sec wish we were headed to New york insteAd! Headed to tahoe for some snow! our 2018 is filled with tRavel plans to visit Las vegas, new york, san francisco and hawaii. This would be a perfect luggage for me. Thanks for sharing! Hoping i can use thIs luggage for my 1 year old daughter and i’s trip To dubai to see her dad! I am pregnant and we have been Awaiting my husband’s return to the states. In the meantime we will both be going back and forth to be reunited as a family until i deliver in the states. This luggage would be perfect for my upcoming travels! I am planning a trip to nantucket for my 40th this summer! headed to Italy mid january with my boyFriend! Rome, Florence & venice! We’re so excited its our first time to italy! These bags are BEAUTIFUL! My husband has planned a trip for our one year anniversary (january 21st) i don’t know where we are going, but i would love to use this luggage! I wish to travel to Spain for a trip. I love the culture and the history the it has. Hi! I would love To take this BeautifUl set to my SydNey, AustraLia trip this christmas! Love this luggage! Our next big trip Is to Hawaii with my Family + husband. My next trIp is to poland or turkey!! I’ve never been to either and i’m so excited to bring my rose gold calpak luggage!! This luggage is so cute! Ive had my eye on these rose gold ones. We are headed to the beautiful san diego for our next Vacation. I would love to Have this beautiful calPak set for my WEDDING/honeymoon in HonoLulu, Hawaii. My wedding date is March 28, 2018. Thank you in advance! I don’t have a vacation planned but I would love to TAKE THESE TO London some day! Would love to win this suitcase! HEaded to Dallas then Colorado for a trip! My next trip is gOing to be a belated Honeymoon with my honey!! We’Ve been saving for a little over a year now and aRe ready for Paris and Italy!! I would love to use this Beautiful luggage on my trip to Mexico!! I would take my fiance to Jerusalem, Israel to see our family. I have been following you and your sister for over a year now and i love your style! This spring break i am headed to the bahamas with my soRority sisters and i would love to take this gorgeous set with me! Also nOt sure whY some words are randomly CAPITALIZED. Sorry about that! I dReam of suprising my husband with a trip home To ireland!! I am heading to paris in march and would loveee to Have this luggage! Hello! Im flying to PHiladelphia and new york after christmas! Siesta key, fl for winter break with our newborn! Girls 30th trip in the works! Would love this luggage! Will be making my way to indiana from georgia to see my family for christmas. We will be going to the u.k. Next summer. I love this set of luggage! What a gorgeous color too!! These would be perfect to pack all of my mama ESSENTIALS in for our next trip to The beach! I would love to use these on my vaction to idaho in a few months. Next vacay— Plantation stay in Natchez, MS! Would love to make plans to go to toKyo, japan! The calpak luggage would be awesome to take with me! Costa rica for spring break! I WISH i was going somewhere warm this holiday.., like hawaii! We are going to New Beach Ca for christmas! Im heading to La with some girlfriends to visit a friend who just moved out there! We all live in Nashville. Love this set and i deaperately need new luggage! Thanks! Heading to CO for some skiing!!! WisHing I were heading to hong Kong for the holidays! I would love to take my kids to maui!! Sunshine, beaches, hiking & shaved ice, what more could you ask for? I am headed to Guatemala on March 12-17th with ImpactJunkie to provide educational opportunities to the children there through trade work and digital technology. We will also be providing healthcare and nutrition EDUCATIOn for children and families there. I’d love to win this luggage to go with! Wishing i could be at hong kong for the holidays! I am hoping to go to Quebec city! 🙂 love your blog emily! Off to colorado to ski in the beautiful Rocky mountains!! 😍😍😍 dEf in Need of luggage for the trip! I’d like to take a trip to Florida. Africa!!! These lugguge pieces are Gorg! 😍 And so is your blog!! No vacations planned right now, but wish i couLd take this luggage on a trip to disneyworlD! We are headIng Charleston For our bEst friends wedding! These will be great for me, my husband and three kiddies! I love this luggage!! Looks so chic! Im going to London on my next vacation and i cant wait!! I think it is great what you are doing with these 12 Days of giveaways. I really hope i am the lucky winner of this giveaway, as my husband and i Are going on a cruise 🚢 for our honeymoon, next Saturday the 16th of decemembEr. This Luggage would Be perfect to take on our first cruise! wishing i could go to hong kong for the holidays! Love! Love! Love! This luggage! I would love to have this foe my upcoming girls trip to nyc! I will be going on a vacation for New Years for my husband’s very first diSney worls Visit! And we are also planning a trip next year to eiTher maui Or new zelanD! WoulD love tO take this with us, rose gold is my fave and matches my engagement ring! These are soooo dreamy and exactly what i need for our trip to paris in january! We are taking ouR fiRSt big trip with our 11 month old Son to celebrate my husband getting Into medical school. I was just tElling him the other day we need new luggage! This set would be perfect for my bachelorette trip! I am going to Florida for my Christmas break with my family and then in the spring i am going to Italy and also spain!! Would lovr to use this pretty lUggage in mY travels. Hoping to go to europE This next summer! These would be perfect for it! i’M GOING TO THE BAHAMAS IN JANUARY FOR MY 30TH BIRTHDAY TRIP AND A CHIC NEW LUGGAGE SET IS ON MY WISH LIST THIS YEAR!!! We are headed to mexico In 2 Weeks and i would absolutely love to pack in this Luggage! Traveling to Florida for the Holidays! I have been dying for this set of lugguage! I will be traveling to aruba this summer. I am hoping after xmas i will be able to Travel fo Fl! Im going back home to dallas for christmas!! I haven’t BEen home from NY siNce the summer tIme. Soooo excited! My next vacation goal is to head back to San Fran to go whale watching with some of my closest friends in January. Going to wIsit my family in washington state. We will be flying to Spain in July of next year, would love to win this luggage set! i would love to be going back to florence, italy! I would love use this luggage for our upcoming trip to colorado! Headed to nAPA, Deer Valley and india in January and FeBruary. This Luggage would be perfect for trips big and small! These are so lovely!!! I would use them to travel hopefully this coming year to canada! ThaTs my goal! Hopefully i am headed to ORlando for nye to watch my lSu tigers take down the fighting irish!! heading to europe for a three month trip and this would be the perfect luggage to get us through. we’ve been dying to try the calpak luggage. My husband and I are heading to CABO next month and I wouldn’t mind stepping off the plane with this gorgeous set! three month trip to Europe. i’ll hopefully be heading on a cruise to Mexico with this amazing luggage! Oh my gosh! How awesome it would be to have this a-D-O-R-A-B-L-E suitcase for when i go to santorini greece next summer!!! I wish to travel next to somewhere in the carribeans or chichago! WOULD LOVE NOTHING MORE THAN TO HEAD DOWN TO THE SUNSHINE STATE WITH THESE BAD BOYS! My next trip is to san antonio to watch my team in the alamo bowl, but i wish i was going to a beach or to the mountains… or really anywhere, im not picky! My next vacation will be to hawaii. One of the organizations my company supports will be helPing women that have been faced with domestic violence at a local shelter. As a supporter i want to use to vacation to help as well. This amaxinG luggage set wiLl Definitly go to great use. Ive been Looking atthis luggage for my trip to europe gor two months this upcoming summer! But next trip will be miami gor sister bachelorette TrIp! Hi emily! I would love to be the winner of your calpak Giveaway! My boyfriend and I arE going to san fRancisco next month and i would love a new luggage set! I would LOve to win this stunning luggage. My husband and i have a three year old daughter. We havent been on a vacatIon since before our daughter was Born. Our most memorabkle vacation was to maui- ouR honeyversary and i woUld love to go back! I hope i win!!! My finace and I are going to Irleand for our Honeymoon! I would love to have this LUGGAGE for my travels! My second post has my iG name, NOt trying to Enter twice. Hi! I am actually hoping to gift this to my mom who will be retiring next Year with my dad. Their Plan? TRAVELING with maybe a first stop in Paris where they got Married! Ahh!! I was just telling Eli how i need New luggage! We love traveling and our next trip is to Seattle and then NYC!! Would love to travel to Hawaii!! While not necessarily a vacay, I am going home to iowa (from texas) for christmas. i wasn’t able to make it back for thanksgiving, so it will be so nice to see family! and I’m always dreaming of a visit to charleston or abroad to europe! 🙂 Thank you for hosting this great giveaway! I will be traveling to Paris this January on a fabulous trip where I will be attending PARIS FASHION WEEK! I am so excited! When Paris Fashion week is over I will then be heading to Budapest to celebrate a friends 30th birthday! I love traveling and try to whenever i have the opportunity. Having the perfect luggage that is large enough to carry All of my essentials plus light enough to pack a little more than i woukd have been able to in my older luggage is very important! 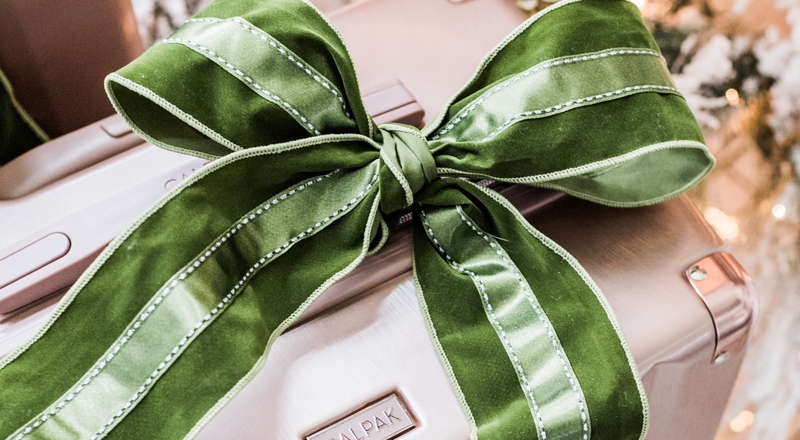 I love calPAk’s luggage for its BEAUTIFULLY crafted and innovative design keeping us fashion enthusiasts in style when heading to our favorite destinations via car, train and plane! I hope to have the opportunity to win this fabulous luggage set and keep traveling In style! ThIs set is 😍🙌🏻! Greece…one day, but for now, anywherE and everywheRe my family is located. I am headed to puErto valleRta mexico! Heading to colorado with those beAuties! Love this coloR!!! Heading to meXiCo In feb and this would be perfezt! i’D take it to florida next year! I would be so grateful if i won this giveaway because i am a college student who travels out of state, and i am also preparing to study abroad in rome —i can just Imagine how cute my travelling pictures would be with this luggage alongside me. I have been Eyeing these for mOnths. Love love love the pink. Im taking these to Cuba! This LUGGAGE set is amazing! I would love to win it and take it with me to Europe to Celebrate our 5th wedding anniversary. We have not been back since we got engaged there 7 years ago. Heading to a cabin in Buford, GA THAT WAS JUST RECENTLY FEATURED ON THE CW’s new show DyNasty! 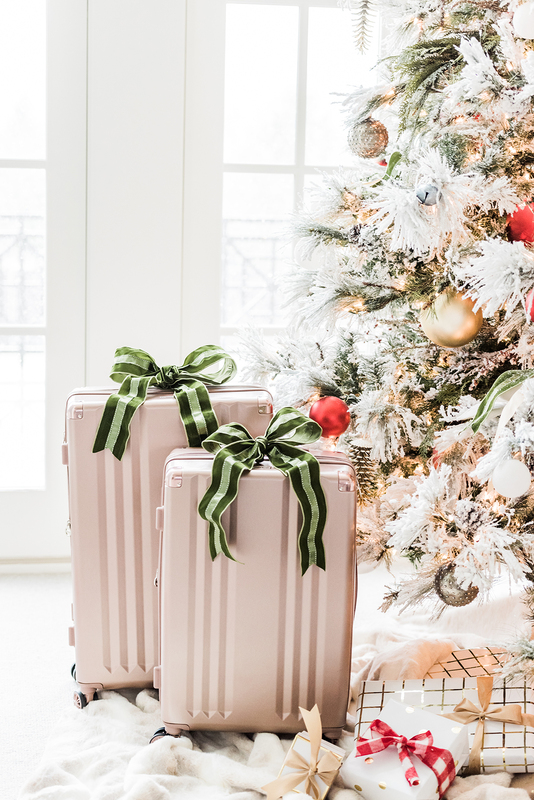 I am going to jackson Hole, Wyoming, for the new year with my husband and some friends, and i would love to take this gorgeous luggage on our trip!! I absolutley adore your blog! My Next trip is actually the most important trip I will be taking. I am going to get married in beirut lebanon in a couple months! I could not be more excited and i DEFINITELY use calpak’s liggage. Ive always wanted to buy this exact one but never get the chance to. This would make my trip even more luxuRious and special! I’m a college student in desperate need of my own luggage so i can stop steaLing my moms! This set is so pretty. I am a lover of travel, going places quite often and always saving for my next trip! My next trip is in January to new orleanS for my 21st bIrthday! I am Going To CanCun, mexico on christmas day with my mom and im sure she Will love This luggage!!! This luggage is to die for!!! OUr next big vacay is Hawaii, but i’d love to travel to Europe with this set too. I’m getting married in jAnuary and we’re going on a honeymoon to arizona! I would love to have this luggage to use for our big trip! My next big vacation is greece next year! This luggage would be perfect for my trip!! Hello! I would use the beautiful calpak luggaGe to go on the multiple bachelorette trips i am going on in 2018. My husband and i Got married 8 months ago and currently share two pieces of luggage. We will be traveling to different locations and i really would love my own set of luggage! @marshgarsh – I’d love to take it to my honeymoon – thailand!!!!!!!!!!!!!! We are Headed to see my parents In oklahoma city for christmas!! I woUlD take this luggage set Home with me for the holidays to caliFornia!!! With My calpaK luggage i’d lovE to travel to venice. For our enGagement my Now husband took me on a gondola in oakland, california. One of our dream vacations is to travel to venice & how Nice would it be to travEl along with my calpak luggage by my side! Planning a trIp to Croatia next suMmer for my 30th bday! Cannot wait to soak in the sun and MEDITERRANEAN! I wish i was going somewhere tRopical! I need a relaxing Vacation!! I hope to win so i can take this with us tOhawaii!!! But im Trying to plan a vacation To san Francisco thIs coming up sring. @chOcmaltkrunch for my next vacation im headed to new york! I am headed to mexico cIty for the first time! Its not somewhere exotic, sunny ir warm but i will be visiting family i havent seen in 10 years! I would love to use these for my honeymoOn in 2018! Not Sure wHere we are going yet but i would love to have these beauties by my side!! I dont own rolling luggage so this would be perfect!!! We are heading back to italy next year for our 10 year anniversary! This would be so perfect! I’m getting married in JanuAry and we are Going to arizona for our honeymOon! I would love t have this luggage to use! Omg.. i have been wanting a good size carry on bag forever. Me and my hubby are headed to Sweeden, Greece and south of itlay in spring and we need to change our regular carRy-on bag since its too “big” for european domestic Flights. Would love to have this. These are So, Sooooooo gorgeous! I love them so much! 😍 What an incredible, generous GIveaway! Our next trip will be to long island(from Arizona where we live), To see my sweet parents and extended family! Thank you for the chance & Merrrrry Christmas! I would love to bring my calpak on a European aDventure! First I’m headed to the winter Wonderland of Minnesota to spend Christmas with my friends and family. But my husband and I are planning our second bucket list trip to Tokyo with a stop off in hawaii! headEd to my brothers wedding in the bahamas and Need this luggeGe!! I would love to win this luggage set for my daughter, who leaves for college in august. I love calpak And their gorgeous designS. Thanks, emily, for thIs opportunity! Absolutely love this idea just in time for all of the holIday travel – also. These are So gorgeous! my next trip is tomorrow! headed to new orleans for my BACHELORette party with my favorite lades, so i wouldn’t have a chance to use it. so i would love this luggage for my sweet fiance and i to use on our honeymoon to napa in february!! I would love to take this luggage on my trip to Alaska!! Next trip is to austin TExas for south by southwest! I would love To use this luggage set to haul all my clothes! I woul use thE calpak luggage to go to Vegas to have fun and visiT familY in the area! New orleans, LA FOR christmas with the family! I would absoulutly love to win these goRgeous luggage for my upcoming trip to Vegas. Super excited for this give away! Been eyeing it for a while now rose gold is my favorite! .. Been saving all of my pennys so i can get my first Luggage set for my HOneymoon to Dubai and India in April. Hope i wiN! Heading to bug sur in tHe Spring and cannot wait. THIS LUGGAGE IS PERFECTION. I AM HEADED TO MADRID, A CORUNA AND LISON ON MY NEXT TRIP. THIS LUGGAGE WOULD CERTAINLY COME IN HANDY! THANK YOU! I would love to win these for my family trip we are going on to the bahamas in february! I will be going to Vero Beach, florida with my @calpak luggage! I AM RECENTLY OUT OF A 7 YEAR RELATIONSHIP 😵 AND DECIDED IT WAS TIME TO GET OUT (LITERALLY) OF MY RUT AND FINALLY GET TO EUROPE! MY AMAZING MAMA IS GOING TO ITALY WITH ME IN JANUARY AND I AM SO EXCITED! THIS LUGGAGE SET IS SO BEAUTIFUL AND PERFECT FOR AN ITALIAN GETAWAY! My next vacation is to the grand caymen islAnds! HeadeD to the snow but wishing it was somewhere warm! I so wish i could be backpacking southeast asia! I want to tour the mekong Delta and the Fields of cambodia! I want to drink all the iced vietnamese coffee and rock my rice hats and traditional clothing! I want to hit up the beaches in thialand! What a dream! our next VACATION will be to New york city! My upcoming travel plans include taking my son to Disney for his 5th birthdaY – a tradition in our family! Im headed to Japan in march and need suitcases, to have these would Be amazing! Hi Emily I hope the end of your pregnancy is going well! I want to go to Hawaii in January. It’s dreary that time of year here in Utah and that is a perfect escape. You’re give aways are fun, thank you for doing them! My husband and i are headed to Telluride in Colorado for New Years! I am from Texas so seeing real snow in December is a dream. We are so excited for our little getaway. Would love to go to ny! I would love to win this set for all my upcoming trips next year. in 2018 ill be flying to Nola and vegas for my bachlorette. On november 24, 2018 ill be flying to kauai to finally marry my best FRIEND on our 11th year anniversary. We actually went to vancouver a couple weeks ago to celebrate 10 years. I wanted to buy one of these carry ons, but NJ, my fiance, told i shouldn’t because we have other things we need to spend money on, esp with our wedding coming up. Thanks for taking the time to something like this and good luck to everyone else! I wish I was headed to Bali! I’ve been wanting to go for years!! saving my pennieS!! Just got back from south africa, headed to argentina next! My husband is currently active duty us air force and we are serving in england so we are blessed enough to tRavel often, our bect adventure id to croatia! I’m a college student going abroad to florence next semester!!! I absolutely love calpak luggage (my Sister has a set that i try to steal once in a while) but don’t have any of my own. With all the other expenses of travelling through europe this would be the most amazing staple to have and one less cost to worry about! i would love to win this goreous luggage set and use it for our upcoming Family trip to florida!! this would be put to great use on my next trip to lake tahoe!! I’d love to Take my fiance to greece for a romantic Trip!! He’s never been to europe and i would live to show hIm!! My handle is @katiersheehan. I wish I were traveling throughout the amalfi coast in italy with this beautiful calpak luggage! If i win, I will definitely have to plan a trip with my husband! Hi!! I am headed a few places soon (I.e back to indy From tennessee to see family, san diego with friends in decemBer!) but the vacation i am looking forward to most is our honeymoon in italy next june!! I am in dyer need Of a new sUitcase and would love to show this off in italy.